Every year a few days after New Year's Day, we post some stats about traffic and comments from the previous year (we do it a few days after New Year's to make sure that we actually have complete data, just in case something goes crazy in the last few days of the year -- and also, because it takes a bit of time to go through all the data, and other work needs to be done as well). For reference, you can see our previous such posts: 2017, 2016, 2015, 2014, 2013, 2012, 2011 and 2010. We still use Google Analytics for traffic data, mainly because it's the easiest to use, even though it is increasingly not the most accurate, in part because many of our readers (*cough* including me) will often block Google Analytics from recording our traffic. As we've discussed in the past, most "traffic" numbers are complete garbage, a fact that most people like to ignore because it benefits themselves. However, here we are only using the traffic stats for comparative or relative purposes, rather than absolute purposes -- which seems much more reasonable (i.e., we'll note which stories got the most traffic, but not detail how much traffic, since we're positive that number is inaccurate or misleading). As per usual, we start out with a look at where visitors are coming from -- and Google says we had visitors from 238 countries this year (up two from last year). As always, the majority of traffic comes from the US, this year right in the same arena as always, with 68% of our traffic originating from the US (last year we noted it had jumped up to 70% from the usual 67% and now it's back at 68%). The UK remains in second place at 5.5% of traffic with Canada close behind at 4.7% of traffic (last year they were much closer at 5.9% and 5.8% respectively). India -- which last year was in 5th place -- jumped into the 4 spot with 2.9% of our traffic, and it jumped over Australia, followed by Germany, Finland, France, the Netherlands and Sweden. These are the same countries as last year in the top 10, but with Finland and the Netherlands switching spots. What's interesting is that last year was Finland's first year in our top 10 (it pushed out New Zealand, that has now dropped down to 16th place -- not much big happening in New Zealand lately, apparently) and now it's already moved up to the 7th spot. If folks are interested, between Sweden and New Zealand are the Philippines, Italy, Japan, Ireland and Singapore. That makes it fairly easy to do our continental roundup, with the top countries in Asia being India, the Philippines, Japan, Singapore and South Korea. It is interesting to see China sending nearly 4% of the traffic from Asia (it's 8th on the list of countries in Asia), as we've been told the site is frequently blocked in China. The top five in Europe all made it into the top 10 and the only noteworthy bit there is that access to the site from Russia keeps dropping. Two years ago Russia made up much more traffic, but over the past couple of years it's kept dropping. In South America, Brazil leads the way, once again. Peru leapfrogged over Argentina, Colombia and Chile to send the 2nd most traffic after being 5th last year. And those other three countries round out the top five. Two years ago we noted that nearly all of Techdirt's traffic from Africa originated in South Africa, but last year, much more was coming from Nigeria and Kenya. Indeed, this year, South Africa provided 35% of traffic from Africa, with Nigeria at 21% and Kenya at 9%. Next up were Egypt at 6% and Ghana at 4%. As per usual, it's fun to take a look at the very bottom of the list, for the countries that send us a single visit per year (Christmas Island!) or perhaps 2 visits per year (North Korea!). I wouldn't read too much into either of those... including any thought that anyone in either place actually visited Techdirt. Basically every year we joke about how reader PaulT takes credit for Gibraltar being the country sending the longest duration visits, which has been consistently true since we started this... until now!. I know PaulT is still around, but maybe he's started blocking Google too, because Gibraltar's duration is now way down in the middle of the pack. Instead, the longest duration comes from... Nepal? Nepal! How about that. Of countries that actually send significant traffic to the site, India has the longest duration (Spain is similar as is Pakistan and New Zealand). Chrome remains the most popular browser used to view the site -- holding steady at 49% of all our traffic. Safari is second at 17% and Firefox with just 10%. Still a somewhat astounding 5% of traffic came from Internet Explorer and another 2% from Microsoft Edge (who uses those?!?). Mobile now represents 39% of our visits and, yes, we've finally inched over towards improving our mobile viewing experience. If you have not yet, check out our beta site to test it out (scroll up to the top of the page for a link to switch over to the beta site, or go into your preferences). It will greatly improve the mobile browsing experience. 35% of mobile visits come from an iPhone and another 9% from an iPad. The Android market is a lot more fragmented, obviously, but it's dominated by various Samsung and Google Pixel models, all hovering at about the same levels of traffic. Unlike other sites, we've never focused on relying on others for our traffic by playing the "social media game" only to freak out when those properties change their algorithms and sites freak out as all their traffic disappears. 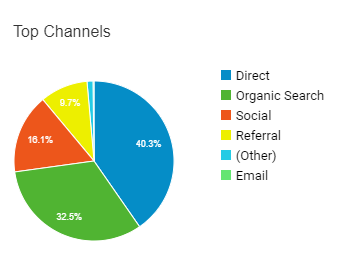 So we're always happy to see our largest source of traffic remain direct visits to the site at over 40%, and only 16% of our traffic coming from social (though, feel free to share our stuff on social media -- we don't mind, it's just that we don't play silly games ourselves to juice our traffic). In terms of sites that do drive traffic to us, Reddit leads the way, followed by Twitter, Facebook and Quora. We also get some traffic from Smartnews, Fark and BoingBoing. In terms of search inbound (nearly all from Google) as per usual, much of that traffic is really "direct" traffic as it's just someone typing "techdirt" into Google to get to our site. Oddly, the single largest query that lead people to our site that was unrelated to some version of "techdirt" was... "can you plagiarize yourself". Apparently (I had no idea), Google links to a Techdirt article in the "Answerbox" on that one, and over 5,000 people did that search and clicked through. Huh. Sending nearly as much traffic is the query for "1 btc to afa". It appears that the top search result on that query is an old 2013 post about someone buying 5000 Bitcoins for $27 and then forgetting about them before rediscovering them years later. I have no idea why Google thinks that's a good link for converting Bitcoin prices to Afghani currency. Perhaps the Singularity isn't quite upon us. The highest search result that makes sense (beyond the variations on Techdirt) is a search on FOSTA. Pretty good mix of stories in there. The only "oddity" is the 2015 story about Kim Dotcom, but that's been Dotcom's "pinned tweet" for years, so whenever he's in the news, that story suddenly gets a ton of traffic. And now we get to the fun stuff (and my personal favorite part): the top rankings for our commenters. Though, I should note -- as we mentioned earlier this year, that one of our top commenters, Roger Strong unfortunately passed away in May of this year. In 2017 he had been our third most prolific commenter. While he's certainly been missed, he does make a well deserved final appearance in the lists below for having the 2nd most comments flagged as "funny" over the course of the year. To be honest, Thad's 10th place finish is a bit unfair, as he commented for a while before signing up for an actual account mid-year. So, in all reality, he's probably closer to the top of the list.. but rules are rules, and we're only counting signed in commenters for this list. One other note is that PaulT dethroned That One Guy who had three years in a row at the top of the list (PaulT has always been near the top spot, but finally knocked That One Guy down a peg). Congrats to James Burkhardt, who not only is a new entrant on this list, but who had the highest percentage of his comments judged to be insightful of anyone on the list. Keep it up, James. Great work. And of course, the trio of That One Guy, Stephen Stone and PaulT seem to be quite a strong trio of commenters in helping to give thorough, thoughtful and insightful comments over and over again. That One Guy topped this list for the fourth year in a row (by a wide margin each time). Impressive. Once again, it appears to be much, much, much more difficult to get the "funny" icon, so folks need to pick up their game on that one. Re: WAIT A SEC! The books were never open! Where's the TOTALS? What is this obsession you have with account holders who mostly lurk? Who cares if it takes someone years between posts? Perhaps they signed up back in the day for something they really, really, really, really wanted to say, but then didn't feel they needed to add anything for years more? Perhaps they retired from being a wage slave and finally had some spare time to read more and then ended up commenting once more?